Yet more gems have been unearthed from Bunker Hill this week. Kim and I have discovered, thanks to a tip from Rick Mechtly, a painting exhibit of Bunker Hill from the 1950s at Angelus Plaza, the retirement center just across from Grand Central Market. 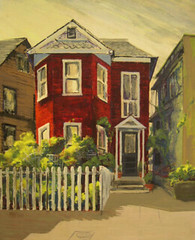 Kay Martin, a relocated Easterner, painted this exhaustive collection when she learned the neighborhood was slated for demolition. The collection was donated to the CRA (Community Redevelopment Agency) a few years back, and since they are the very agency which signed off on the neighborhood’s death sentence, it is appropriate that they have installed the work back on Bunker Hill. I encourage you to visit the exhibit, which will be on display indefinitely. There are paintings at that entrance, and throughout the first, second, and third floors. Simply inform the front desk that you wish to browse the exhibit. Please don’t miss the opportunity to take in the vista from the Promenade, the 6th floor (“P” in the elevator button schema).